If you control a Level 3 monster other than “Psychic Wheeleder”, you can Special Summon this card (from your hand) in Defense Position. You can only Special Summon “Psychic Wheeleder” once per turn this way. If this card is sent to the GY as Synchro Material: You can target 1 monster on the field with less ATK than the Synchro Monster that used this card as material; destroy it. 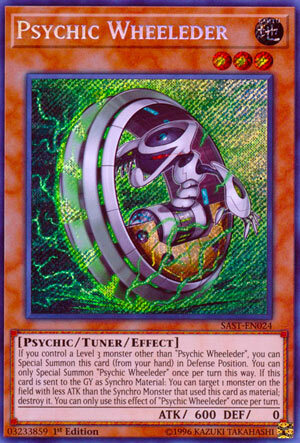 You can only use this effect of “Psychic Wheeleder” once per turn. It’s time to finally take a good look at the Savage Strike set with this week being some of the better cards in this set, Sunlight Wolf would likely be in this week if Salamangreat week didn’t happen, and here we start with a card to help boost Synchro Summoning, Psychic Wheeleder. Wheeleder is a Level 3 EARTH Psychic Tuner with 600 ATK and 0 DEF. Those stats are laughable, but it’s a Tuner so I don’t expect it to be used as a beater, being a Level 3 EARTH Tuner does open up Naturia Beast with a Level 2 EARTH, and Psychic with that Level means Emergency Teleport if you need this but didn’t draw it. Now if you control any Level 3 monster outside another Wheeleder, you can immediately Special Summon this from your hand in Defense Position and you can only summon it this way once per turn. So it makes for a quick Level 6 Synchro, something like Brionac sounds great with this or maybe Naturia Barkion if you use another EARTH and play against a Trap deck, or if you have Psychic Tracker as well (a non-Tuner with the same summoning condition as this) you can go into a Level 9 like Trishula, which is never going to be a bad card. I should also mention that you aren’t limited to Synchro Summoning and could maybe Xyz Summon a Rank 3, though you might as well use Psychic Tracker if you intend for Xyz Plays with these cards since that is only a common vs this being a Secret Rare, or go into a Link Monster, which sadly Crystron Needlefiber isn’t in the TCG for this yet. If this card is sent to the graveyard as a Synchro Material, then you can target a face-up monster on the field with ATK lower than the ATK of the Synchro Monster you summoned and destroy it. Having any form of removal is great, especially to make up for the inherent minus of Synchro Summoning a monster. This does synergize with the aforementioned Psychic Tracker as well since that boosts a Synchro that uses that as material by 600 ATK, which means Wheeleder can destroy a stronger monster. The destruction effect of Wheelder is also a once per turn as too much destruction can get overpowered with bigger Synchro plays. Wheeleder is a great card to use for Link, Xyz, and especially Synchro plays as the former could use Tracker with similar results, but this card being a Tuner does give it a slightly better score than Tracker, plus its effect for being a Synchro Material is better. Art: 4/5 Psychics typically have some insanely cool artwork, even though this is one of the least inspired artworks it feels like. Psychic Wheeleder…this is a pun, a poor pun, but Alex enjoys puns, and it’s Monday, so we’re going to roll (another, better pun) with it. So, Psychic (gasps) Tuner, always a good thing in a Monster, Level 3, and Earth…600 attack and 0 defense, both rather paltry on a Monster of this Level, or in general. So if you control a Level 3 Monster (other than this card) you can Special Summon this card from your Hand. Said Special Summon is face-up defense position. This opens up a Level 6 Synchro Monster (at the very least) given you’ll have the minimum of two Level 3 Monsters out. Psychic Nightmare is an option here, as does HTS Psyhemuth, or Hyper Psychic Rider, and this guy is a good card for Gusto theme players. Psychic players have a LOT of options how to run and build their Deck these days. You’re only allowed to Special Summon this card once per turn this way (but could still revive other ways, from the Graveyard, pull from the Deck, etc) and if Wheeleder is sent to the Graveyard as Synchro Material (as it should) you can Target and destroy a Monster on the Field (of either player, face-up or face-down, attack or defense) and destroy it, as long as it has attack lower than the Synchro you brought out. This is a great card. It’s going to play you into something bigger and more powerful, it destroys when you use it as you’re supposed to, and can very easily Special Summon itself. Which is a bonus, because even if you don’t, you’re still going to make at least one big play the turn you get this card on the Field. Great card for any Psychic player out there. Art: 4/5 Fun but not that inspired. It is a weedeater err wheeleder as it says, and the colors of the grass against the gray/white of the wheel is fun.